Taking it to the street. Part 1. 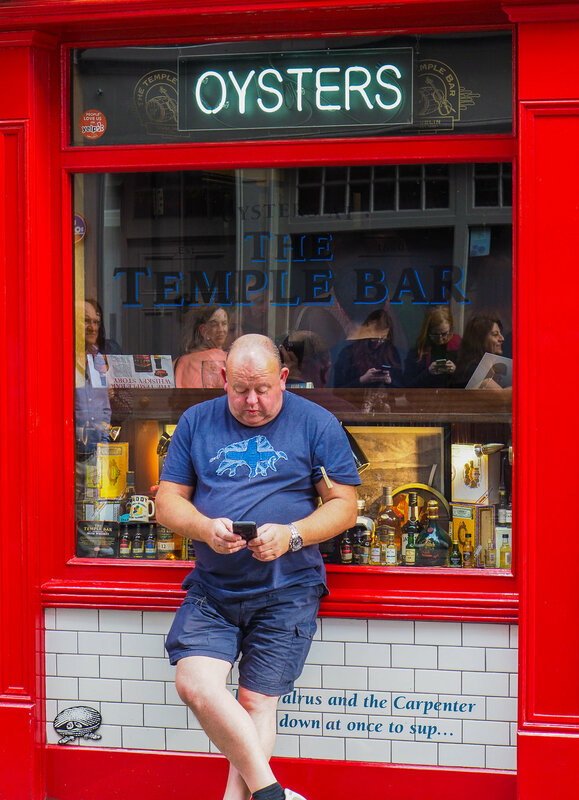 I'm more into landscape, coastal and sea photography but when I'm travelling I enjoy street photography as well. Anonymity is much easier found away from home in bustling cities and towns. What I like is the vibrancy of colour and the pulse of life on the streets. It's a beautiful world. It can be a visual feast and possibly no more so than in Ireland. I'm often (well, maybe always) looking for a picture and that's not difficult in the Emerald Isle. It's the out of the ordinary scenes like the one below. We all register scenes from different perspectives. To someone living on this street, its just everyday life. For me, its like eye-candy because it is not an urban sight I have ever seen or would expect to see back home. I just loved the colour. Photographing people is not easy but in a large city bustling with tourists, it is barely noticed. One of the keys is not to carry around a camera the size of an over the shoulder missile launcher, or large enough to cast a shadow across the street, but to keep it small. Social justice. Dublin. (I feel there's a bit of a tartan theme going on here). 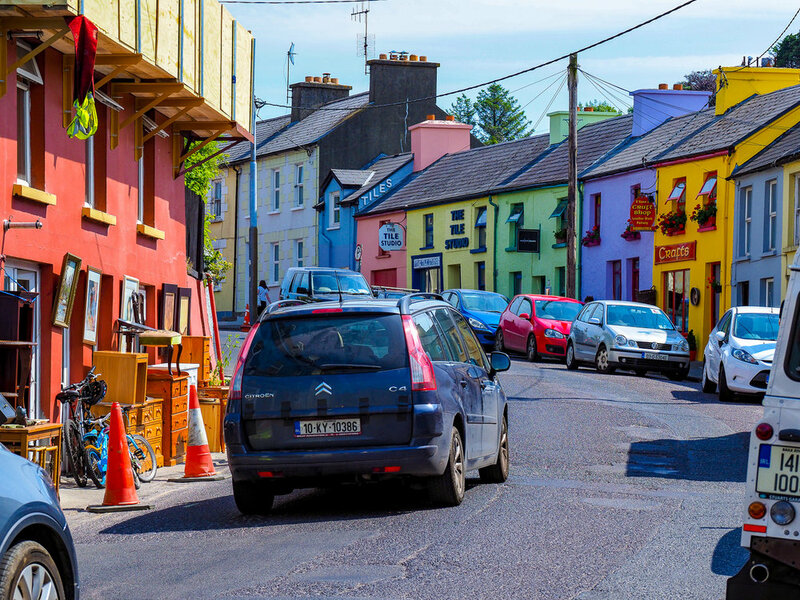 This year in the travels from Dublin to West Cork in the very south of Ireland the colour in the towns was a visual delight. 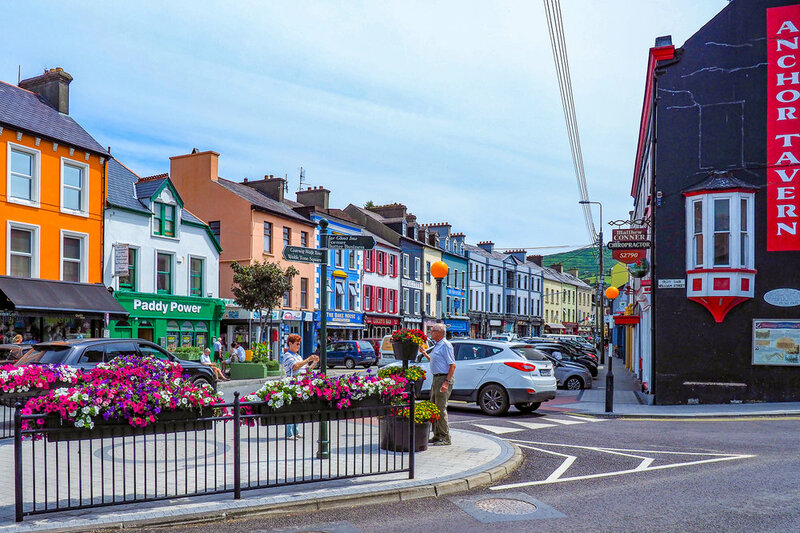 The streets were invariably clean and there seemed to be a sense of pride maybe engendered by the tidy towns competitions held in Ireland. Tidy indeed. Eyeries, Beara Peninsula, West Cork. It's pretty rare to see these sort of in your face colour schemes lining the streets at home in New Zealand. Any sort of paintwork like these on a New Zealand home would more likely consign it to being regarded as an eyesore. In Ireland, it just works. Maybe it adds colour to what might be an otherwise monotone streetscape as annual sunshine hours are not that flash. Actually, thinking about our dreary wet weekends this winter a bit of colour like this might lift the spirits. 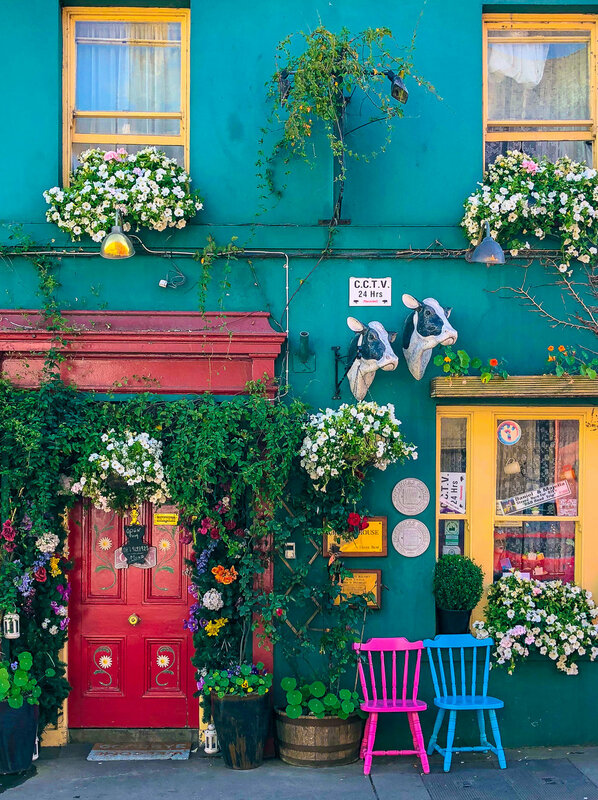 Eyeries has often been referred to as the most colourful village in Ireland and has often been honoured in the National Tidy Towns Awards. I can say from experience that someone in one of the homes here makes a mouth-watering lemon drizzle cake. I'll exercise my right to silence as far as the coffee goes though. Beautiful Eyeries, Beara Peninsula, West Cork. Who would need street numbers? You'd just say 'I live in the yellow house' or 'I live in the pink house' etc. They call West Cork "A Place Apart" based on its striking landscape, community, and culture. 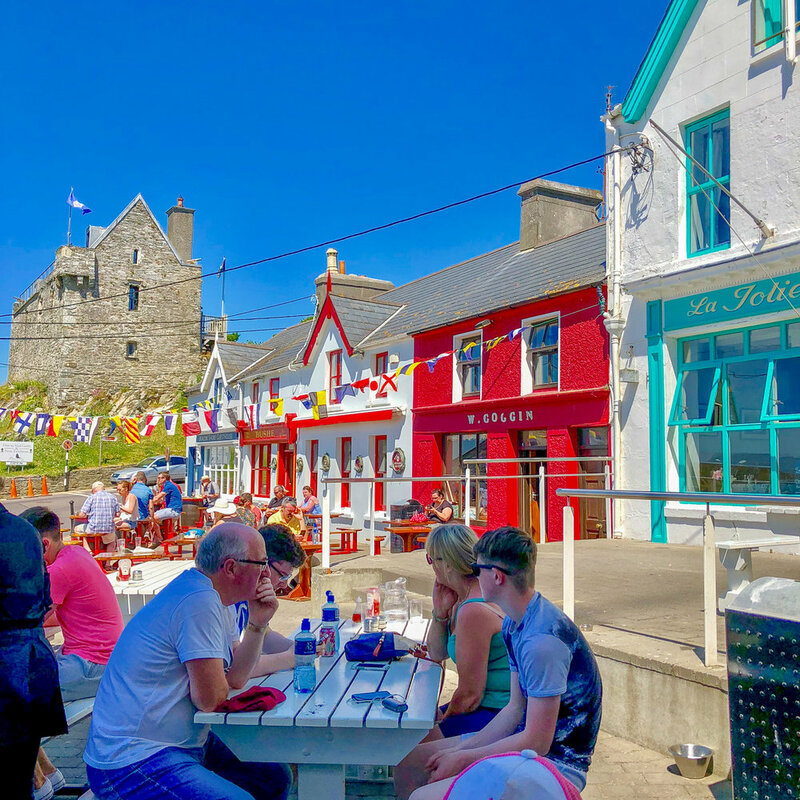 Sitting at the head of Bantry Bay is Bantry, an old fishing port and heritage town and once again a happy snapper's delight. The only downside to these beautiful towns is they have more than enough women's shoe shops which meant I kept losing my wife. It's hard to keep your camera in a restful state when you are confronted by such vibrant streets. Colour my world. Bantry, West Cork, Ireland. 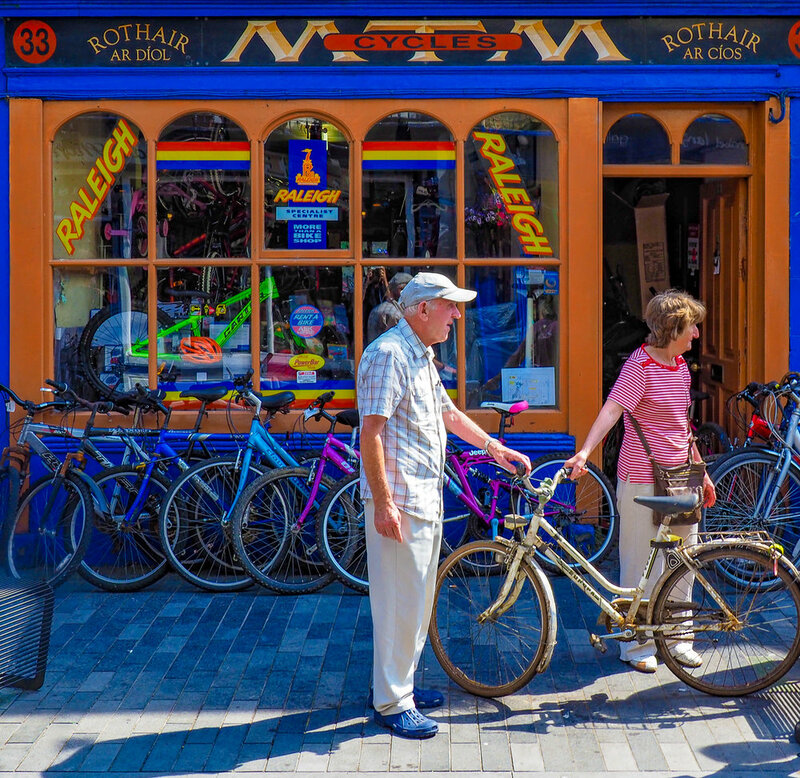 There was a conversation outside the bike shop below in Clonakilty between these two that went on and on and on and on. I wouldn't have been surprised if it had still been going the following day. Well, I guess it is Ireland after all. Its all about the colour of life and it sure abounds in this land including dear old Skibbereen. Skibbereen and surrounds was one of the worst affected areas in the devastating Irish famine 1845-1852.
Who took the Mickey out of Mick Finn? Clonakilty, West Cork. The phrase al fresco is borrowed from the Italian language meaning 'in the cool air'. It was anything but cool in seaside Baltimore, West Cork. That vibrant colour on the ground and in the sky once again made for a photo opportunity. This time with an iPhone. I see red. Something in the photo below would point to it indeed being a street scene in Ireland. So there you have it. 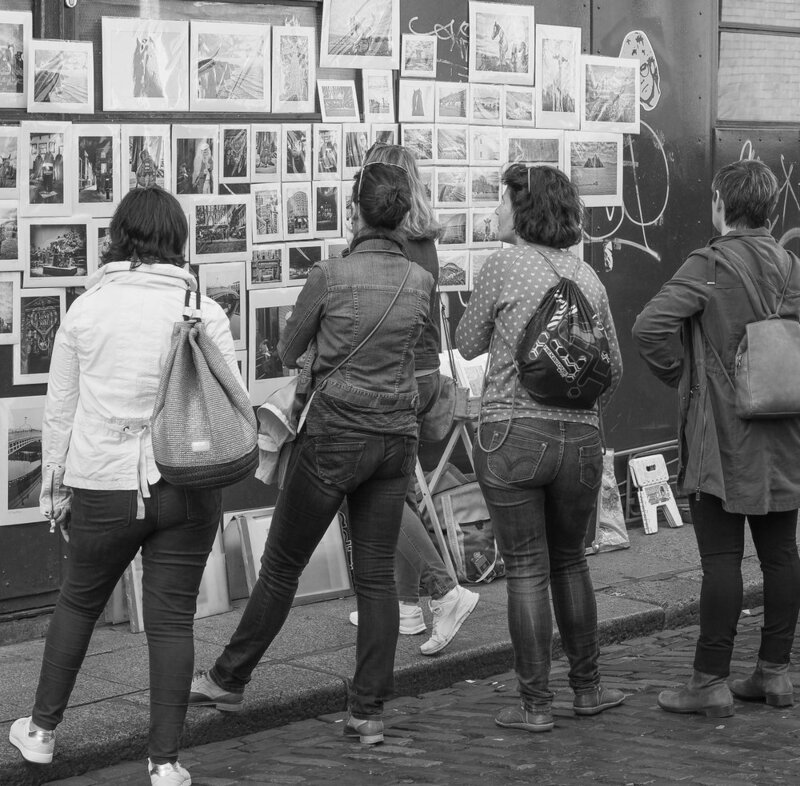 The world is your oyster when it comes to street photography. For me it's a nice diversion from my 'normal' photography. I'd be reluctant to get into it in a big way at home, but when away, its a different story. ......and street photography so often tells a story. Next time I have to show a few just as colourful 'shop front' scenes from the UK. Until then, I'll leave you with this main street scene proving not everyone has a cat or a dog. Until the cows come home. Eyeries, West Cork, Ireland.